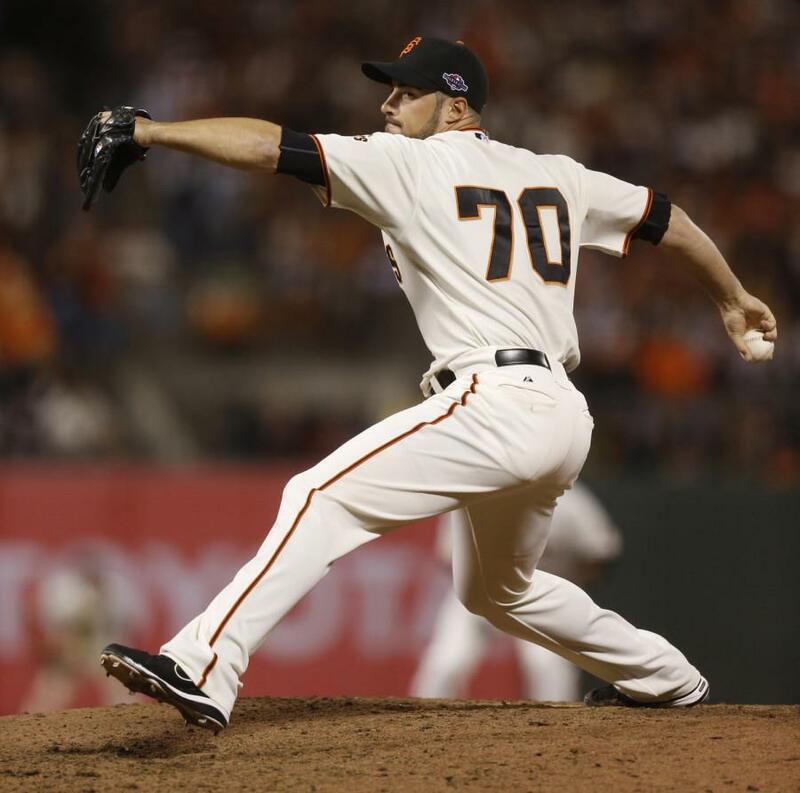 Former Northwestern pitcher George Kontos has become a key reliever in the San Francisco Giants' bullpen. When George Kontos pitched a third of an inning in Game 1 of the 2012 World Series, he became the third Northwestern alumnus (along with Joe Girardi and J.A. Happ) to ever appear on baseball’s biggest stage. Kontos played three seasons at NU before signing with the New York Yankees as a fifth-round pick in 2006. A right-handed pitcher with a low-90s fastball, he debuted in the majors with the Yankees in 2011 then contributed to title-winning teams in 2012 and 2014 with the San Francisco Giants, making relief appearances throughout the 2012 playoffs, including one in the World Series. Now, after shuttling between Triple-A and the majors for several seasons, Kontos, 30, appears to be in the big leagues for good. He has a 1.59 ERA and .85 WHIP in 34 innings pitched this season and has earned a steady role in San Francisco’s middle relief corps. Among former Northwestern players, Kontos ranks ninth all-time in MLB appearances, fifth in innings pitched, fourth in strikeouts and first in ERA (excluding those with fewer than 15 innings pitched). The Daily caught up with Kontos before a recent game against the Mets at Citi Field to discuss his relationship with other former Wildcats players in the pros, the retirement of longtime NU coach Paul Stevens and even Dillo Day. The Daily Northwestern: So what do you think of Coach Stevens finally calling it quits? George Kontos: You know, Paul’s been there for a long time. He pretty much ran that baseball program by himself for a long time. He did a great job there, he’s coached a lot of people — a few major leaguers — and the fact that he can ride out on his own terms, I’m very happy for him. The Daily: Do you have any crazy Paul Stevens stories? Kontos: I was thoroughly convinced when I played there that he decided what his mood was going to be before he came to practice that day. I’m thoroughly convinced that he’d be like, “Today I’m going to be happy-go-lucky,” then the next day he’s like, “I’m going to be a little more stern today.” I’m convinced that he just decided before he walked into the baseball field onto the turf. But overall, he’s a great guy, he means well. He really cares for his players and looks out for their well-being. The Daily: I’ve heard stories about how he could be somewhat of a disciplinarian. Kontos: Paul’s a little bit of a firecracker. If things didn’t go right, we’d run after games. If things didn’t go quite well, we used to run (to the) Baha’i Temple as some of our conditioning. And some days he’d be like, “Oh, you’re doing it twice.” Those days weren’t the greatest days. But my last memories at Northwestern were when we had one of the better years that we’ve had in a long time in 2006. We finished second in the Big Ten, and we were in first for a long time, up until the last weekend. And then we split against Purdue and Michigan won three out of four against whoever they were playing, so they ended up hosting the Big Ten Tournament, but I think we finished in conference something like 16-8 (ed. note: the 2006 Wildcats were 26-33 overall, 21-11 in the Big Ten), which is one of the better records that we’ve had in the Big Ten in a while. The Daily: So why don’t you think the program has been able to take the next step and consistently contend? Kontos: It’s one of those things where Northwestern, academically, is a very, very good school. They don’t really let you slip in with subpar grades. I think you’re automatically behind the gun in recruiting because you need people who are athletically capable and academically able to handle that school. Getting into Northwestern is the most difficult part, but it’s a pretty selective school, so with trying to keep guys from the area — which I know the program has tried to, keep guys from the Chicagoland area in there — it’s one of those things where it’s tough when you have those academic standards to live up to. The Daily: Have you heard about the new renovations, the new turf field and everything? Kontos: Yeah, I’ve seen some pictures. I haven’t been back there since the new turf has been done, but I’ve seen some pictures on Twitter, and it looks really nice. The Daily: Do you think that helps with recruiting, as someone who’s been through that? Kontos: Yeah, the better your facilities are, the more you can impress guys on their visits, the better chance you have of landing a recruit that you want. As long as they can continue to get some recruits, continue to get better every year and continue to get some good players in there hopefully the program can rise up and contend again a little bit. The Daily: Do you talk with (Mariners pitcher) J.A. Happ or any of the other NU guys who’ve been in the majors? Kontos: Yeah, I actually played with J.A. I was a freshman, he was a junior, so we played one season together, but we work out every off-season. For the past nine years we work out, we play catch together, we do our little lifting and conditioning and stuff together. (Blue Jays pitcher) Bo Schultz as well. He’s worked out with us. (Padres outfielder) Jake Goebbert as well. I’m not sure if there are any other pro guys still. (Cubs pitcher) Eric Jokisch, he’s around every now and then. So the guys who come out of the program and play professionally, we tend to stick together, work out together, do all that kind of stuff. The Daily: You’ve got to get back and throw out a first pitch. World Series champion, they’d be happy to have you. Kontos: You know what, that’d be great. I was actually very fortunate, after the 2012 World Series I went to a football game, they made me a jersey and they had a little ceremony on the field. Against Illinois, last game of the season, which was cool. The Daily: You have any funny Dillo Day stories? Kontos: Oh man, I don’t think any that I can tell you. The Daily: You’re too old to get in trouble now. Kontos: I know I am, but still. Dillo Day was always fun. It was that one day a year when you can let loose. We kept it pretty tame. Nobody got too nuts. I was always fortunate because I grew up in Lincolnwood, which is just 10 minutes down McCormick (Boulevard), so I was at Northwestern, but whenever I needed a home-cooked meal or if it was one of those days when I maybe had too much to drink, it was a quick cab ride back to the house. It was good. My whole college experience at Northwestern was great, and if I could do it over again, I’d do it the same way. I’m very fortunate to be able to go to school there, which is such a great academic school but also being so close to home and my family being able to come to the games. I think my dad and/or my family probably saw 95 percent of my college starts. So that was pretty important to me. My two choices when I was deciding were Northwestern and Illinois, and my heart was set on Northwestern.